A 45 year old woman presents with a 4 cm mammographic abnormality in her left breast. There are no nodes palpable in the axilla. A core biopsy of the breast lesion confirms ductal carcinoma in situ. She has opted for mastectomy but would like a sentinel lymph node biopsy in preference to axillary dissection. 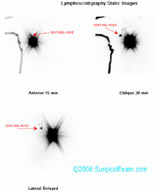 Her lymphoscintigram is shown below. 1. Which patients are suitable for sentinel lymph node biopsy? Sentinel lymph node biopsy is suitable for a select group of early breast cancers. If used for inappropriate patients results are likely to be poor and of little value. Patients selected for the technique of sentinel node biopsy without complete axillary dissection should have early stage disease with a low probability of lymph node metastases. The primary tumour should be less than 3 cm diameter, not multicentric and the axilla should be negative at clinical examination. The role of SLNB in DCIS is limited to those situations where a total mastectomy is to be performed. In this situation SLNB can be justified because if invasive tumour is found in the resected speciment there will no longer be the option for SLNB. Further investigation is required before SLNB can be considered routine for larger primary tumours or multifocal disease. 2. You have performed sentinel node biopsy 3 or 4 times during your training. Now as a junior consultant what would you advise this woman? That SLNB is possible and safe in this situation. The risk of a false negative result in this situation is low using the technique and that the current standard care would be simple mastectomy without any dissection of the axilla. 3. If her biopsy had shown invasive cancer how would your advice differ? In this case the surgeon needs to have demonstrated adequate skill at using the SLNB technique. This is achieved by performing 20-40 SLNB with immediate level II axillary dissection to determine the false negative rate which should be less than 10%. Any surgeon using SLNB also needs to maintain prospective audit to ensure that acceptable results continue to be achieved.